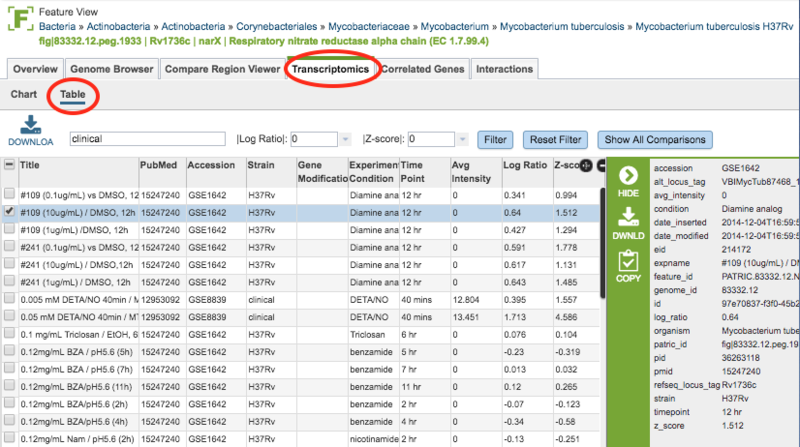 The Transcriptomics Tab in the Feature View provides expression data for the selected gene from all of the transcriptomics datasets in PATRIC in which the gene appears, including levels of expression based on Log ratio or Z score and the strains, gene modification, or experimental conditions. 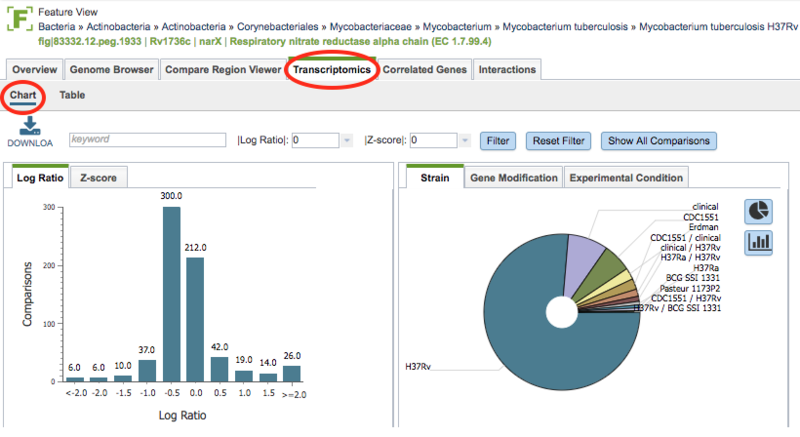 Most of the PATRIC transcriptomics data have been curated from published gene expression datasets related to bacterial pathogens in NCBI’s GEO database. Some additional data sets have been incorporated from the NIAID-funded Systems Biology and Functional Genomics Centers and other sources. Clicking the Transcriptomics Tab in the Feature View displays a histogram of the expression levels of the gene by log ratio or Z score based on all the available data. A pie chart showing the strains, gene modification, or experimental conditions is also presented. Download the entire contents of the data used to create the charts in text, CSV, or Excel format by clicking the Download button above the table on the left side. Filter the included expression levels based on the experimental conditions that meet the search criteria entered in the Keyword text box. Filtering on the Log ratio or Z score will also filter the results to the specified cut-off score. Clicking the Filter button sets the filter, clicking the Reset Filter sets the charts back to the original display with all values. 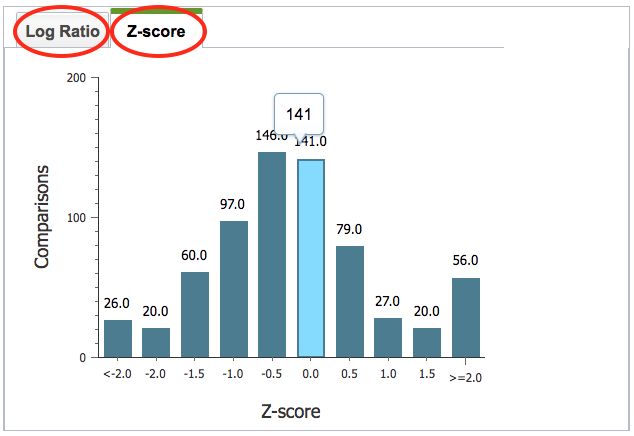 In the histogram on the left of the page, the view can be switched from Log Ratio to Z-score by clicking the corresponding tab. 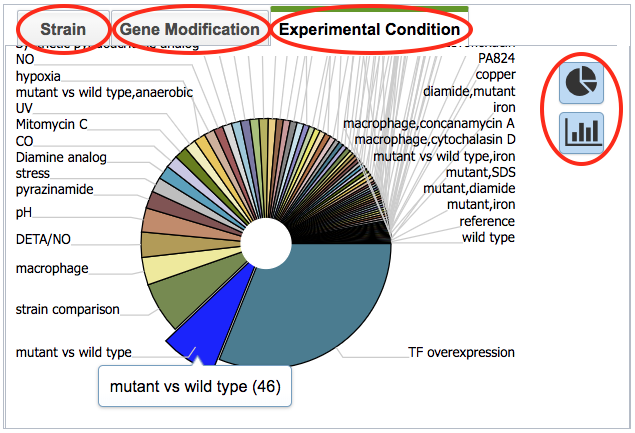 In the pie chart on the right of the page, the view can be switched between Strain, Gene Modification, and Experimental Condition by clicking the corresponding tab. Hovering over one of the pie chart “slices” displays the incidence number for the gene in that category. The display can also be toggled to a bar chart view.